Founded in the 1880s, Steveston became a centre for commercial fishing and canning. At its height there were 15 canneries. It was February when I visited Steveston, a historic fishing village in the southwest corner of Lulu Island, British Columbia. It’s not far from the Vancouver International Airport and the city of Vancouver. The village looks out on the south arm of the Fraser River delta. Steveston was founded in the 1880s and became a thriving centre for commercial fishing and canning. At its height there were 15 canneries along the shore packaging millions of pounds of salmon, herring and other species. Hard working fishermen were known to frequent the many hotels and saloons, as well as the occasional bawdy house. Apparently there was some gambling activity and opium consumption as well. I stopped at Pajo’s Fish & Chips, a popular floating restaurant down among the wharves. It’s a casual place where great seafood comes in a paper cone and seating is on wooden picnic tables. 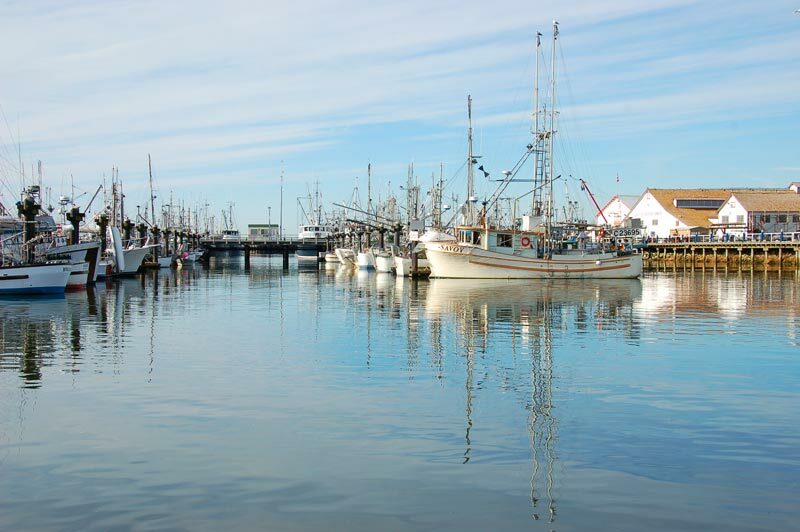 Steveston is still a major fishing port and if your timing is right, fresh and frozen fish can be purchased off the boats. Much work has been done to promote tourism here. The Gulf of Georgia Cannery is a National Historic site right near Pajo’s. I took a bus tour from my hotel in Richmond and a local guide showed us the cannery and some sites along the coast. Steveston marina in February – home to Canada’s largest commercial fishing fleet, comprised of seiners, gillnetters, trawlers and other vessels. The City of Richmond occupies the north part of Lulu Island closer to Vancouver. Richmond is accessible from Vancouver on the SkyTrain, so is the airport and the Olympic Oval, but not Steveston. Check the Steveston Village Community website for more on local attractions and the latest news. Steveston is worth visiting if you are in this part of Canada. Here are some more directions on how to get here. I once worked at Steveston docks making stained glass windows while my boyfriend did time on a dogfish fishing boat. He stunk like old fish and I was covered in glass splinters but we loved the open skies of the harbour. It looks much swankier now but the Steveston skies look as gorgeous as ever in your photos. Michele, Thanks for your comment. I just checked out your website – http://www.michelepeterson.com/ – and it’s great. I didn’t know you are a TMAC member. Are you going with us to Wales? Also, I was born in Manitoba too, a little further south in the ‘Peg’. Steveson is a very cool place. I have lots more pictures that I didn’t have space to put in. Thanks again. I’ve recently posted on several social media sites on how pretty Steveston is and so close to Vancouver city. Great article, too. And such lovely pictures that truly reflect the landscape. I LOVE Steveston. We go there all the time… nice pick. There’s great bicycling all throughout the Dykes of Richmond and around Steveston too.